When the first sixth-generation Camaro hit the market in late-2015, many enthusiasts scoffed at the idea of a four-cylinder Camaro. Scarred by memories of Iron Duke slugs from the early ’80s, plenty of Camaro fans did the proverbial eye roll when they saw it on the order sheet. However, there’s a world of difference between the fuel-injected 2.5L 4-pot from 1982, to the quiet monster that hides beneath the hood of the base model Camaro today. There’s a half-liter of displacement given to the Iron Duke, but today’s 2-liter is a DOHC, direct-injected, turbocharged and intercooled LTG is finding its way in many performance GM vehicles. Where the Iron Duke had 90hp, the LTG comes to the table with 275 hp — that’s factory-tuned conservatively. We say conservative, because like most factory boosted cars, it’s very easy to wake up these engines up with simple modifications. In fact, right out of the gate these cars have been known to click off high-13/low-14 second quarter mile times before your even pop the hood! With the scores of Super Sport and ZL1 Camaros that we’ve become used to in recent years, Allen Mayo took a different approach. Coming hot off the LS-powered 5th-gen Camaro craze, having owned a couple modified examples, Allen was sold on the idea by ZZPerformance after taking a ride in boosted, Ecotec-powered HHR and Cobalt. Shortly after that, he picked up a 2016 LTG Camaro fresh from the dealership and it become a co-project between himself and the boost experts at ZZP. Under the hood, you’ll find the standard LTG engine — but with a few slight twists. The first thing you’ll notice is the ZZPerformance cold-air induction kit, which opens up the intake tract and allows, cool fresh air into the engine. Beyond that, the rest of the induction system is still left as it was from Chevrolet. 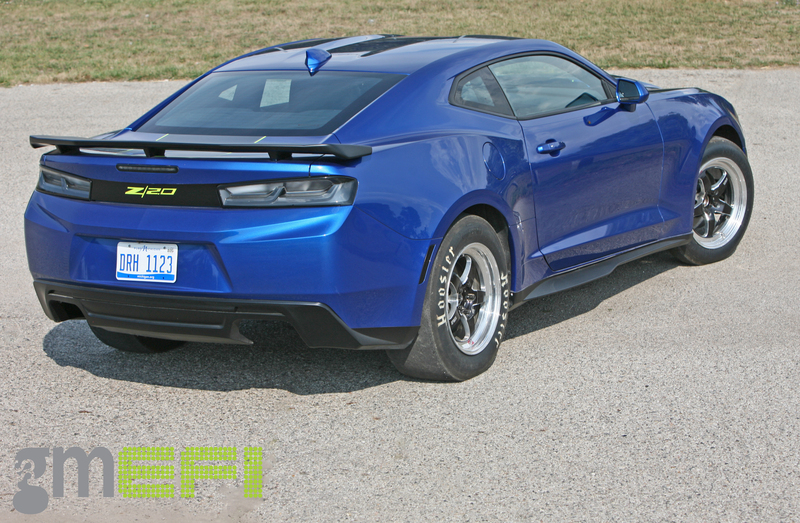 The exhaust system has been upgraded substantially; borrowing the Camaro SS design. Allen’s Camaro utilizes a custom tubular manifold, MBRP X-pipe and mufflers, 3-inch ZZP downpipe and 3.5-inch to 3-inch tubing. The turbocharger system has been upgraded, thanks to a ZZP-modified BorgWarner S257 snail, off-the-shelf intercooler and charge tubes. A TiAL wastegate, recirculation blow-off valve and 25-psi. of boost help take it to the next level, as well. The cylinder head is still stock, with the exception of #82 valvesprings. The bottom end has been upgraded with a set of forged JE pistons and ZZP H-beam connecting rods. The crankshaft is still the same factory forged piece the car had left the Lansing, Michigan assembly line with. Now you would think that with 501 horsepower and 470 lb-ft. of twist to the tires — roughly double than what was advertised at the flywheel, a serious upgrade to the fuel system would be in order. It wasn’t. Beyond a ZL1 fuel pump it’s standard issue LTG — even the injectors! Speaking of that power output, the car’s factory ECU was tuned in-house, with the help of HP Tuners software. What’s even more impressive, is the fact that with factory stuck suspension, the car was able to click off a best E.T. of 10.82 at 122 mph. Naturally, sticky rubber helps. That’s why Allen sourced a set of Hoosier 28×10 slicks out back, mounted to a set of 17×10-inch Weld Racing S71 wheels. Up front, it’s a similar story with 18×5-inch S71s that are wrapped in M&H Racemaster skinnies. The downside is, the stock suspension setup is holding the car back in terms of reaching its true potential. We think if Allen were to take his suspension to the next level, with adjustable coil-overs, et al., the car would be closer to mid-10s. 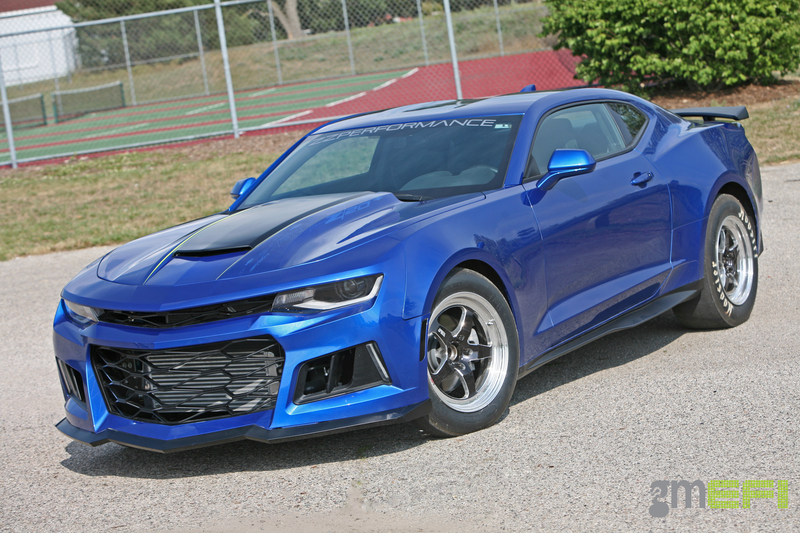 Of course, both ZZP and Allen are both just scratching the surface with this car — as their ultimate goal is to put this Camaro in the neighborhood of 700hp by the time it’s all said and done. Cosmetically, there’s just as many modifications to the outside as there are beneath the surface. Up front, is a Zl1 front bumper and 6LE Stinger hood. Out back, is a GM ZL1 rear spoiler and there’s an American Authority ground effects package to lend a bigger attitude than normal. VIDEO: Redline Motorsports’ Twin Turbo Z06 Deep in the 8s!